Product #1281 | SKU EFS18-55ISST | 0.0 (no ratings yet) Thanks for your rating! 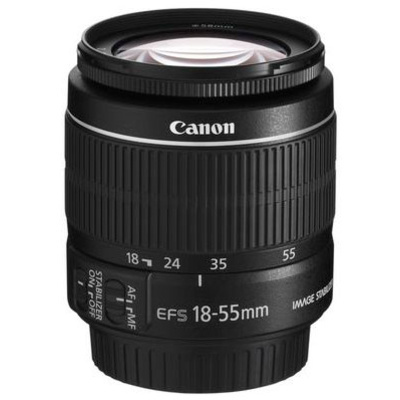 Compact, lightweight, and versatile, the EF-S 18-55mm f/3.5-5.6 IS II from Canon is a standard zoom offering a 28.8-88mm equivalent focal length range. One aspherical element is featured in the lens design and helps to control spherical aberrations and distortion throughout the zoom range for consistent sharpness and clarity. A Super Spectra coating has also been applied to individual elements to control flare and ghosting for increased contrast and colour accuracy in all lighting conditions. Complementing the imaging capabilities is a four-stop-effective Image Stabiliser system that minimises the appearance of camera shake for sharper handheld shooting. Additionally, a Micro Motor autofocus system delivers quick focusing performance and a minimum focusing distance of 25 cm is available at all focal lengths for close-up shooting. Compact standard zoom is designed for APS-C-format Canon EF-S-mount DSLRs, and offers a 28.8-88mm equivalent focal length range. One aspherical element is used to reduce distortion and spherical aberrations throughout the zoom range in order to maintain sharpness and clarity. An Optical Image Stabiliser helps to minimise the appearance of camera shake by up to four shutter speed stops to better enable working in low-light conditions and with slower shutter speeds. A Micro Motor autofocus system provides quick focusing performance and a dedicated AF/MF switch allows for quick switching between auto and manual focusing methods. Minimum focusing distance of 25 cm is available throughout the zoom range for working with close-up subjects.